Personally handed out to all guests aboard the Old Town Trolley by our Sales Representative. Music City Info Route with 60 Locations. Phillips Brochure Distribution with 160+ Locations. State of Tennessee Welcome Centers at Clarksville I-24, Mitchellville I-65, Smith County I-40, Ardmorel-65, Nickajack I-24, Chattanooga I-75, Tiftonia I-24. Four Complimentary Historic Tours of America tour tickets. Web listing on www.trolleytours.com, on things to see on our tour route. Multiple ad sizes to choose from. Locator dot on the map. All art production is at the client’s expense. Please inquire about in-house cost. Discounts are available in conjunction with other Historic Tours of America advertisement opportunities. THINK BIG and make an impact with Old Town Trolley Tours® moving messages. 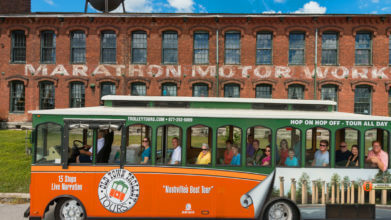 The Old Town Trolleys tour travels the entire metro area including high visibility areas as Broadway, Music Row and Vanderbilt University where they are seen by tourists and locals. Cut through the clutter in advertising and stand out among the best. Old Town Trolley Tours is everywhere you want your message to be! All art production is at the client’s expense. Including manufacture, installation, and removal are an additional charge. A deposit is required to hold space. All terms will be outlined in the contract. Preferred format for camera-ready ad submission is a PDF. InStudio, Quark Photoshop, Illustrator files also accepted. Files must be CMYK, have a resolution of 300 dpi or higher, and must have all fonts embedded. PDF documents created using the “PDF/X-1a” is strongly recommended. Although we do our best to ensure color accuracy, Historic Tours of America is not responsible for incorrect output of color or the color correcting of ads if a color-match proof is not provided. Historic Tours of America’s out of house advertising agency, Blackdog Advertising will provide professional and creative ad design assistance, layout, typesetting, and preparation of electronic files to display advertisers. Photo images must be at least 300dpi. They accept the following formats: .tif, .eps and .jpg. Images from the Web or embedded in a Word document will no be accepted. Photographs to be scanned Production fees vary and will be directly paid to them directly. Email: Ads can be submitted via e-mail to the following: erika@blackdogadvertising.com. Please keep in mind that our e-mail system can only accept files that are less than 10MB. DropBox: For files that are larger than 10MB, you can send it via dropbox.com. Her account reflect our emails above. All artwork must be approved by Historic Tours of America.